After the stresses of last month — the tenting thing and spending 4 days at the Cat Hotel with an angry Binga — you’d think we would get a chance to kick back for a little while. But no — late one evening, my human and her boyfriend came home from some event they were attending and they had something with them. They quickly stuck it in the downstairs bathroom in case, they said, it had any diseases. 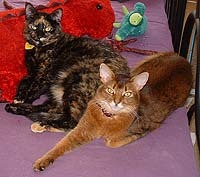 Binga and Boodie seemed oblivious to these strange goings-on, but I had to check things out. I mean, it was the bathroom containing my litter box, after all! 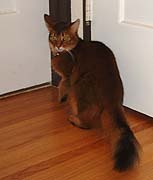 I recognized the smell and when my human opened up the door a crack, I saw my suspicions were right — it was a visitor. She was about my size, although she was a lot younger than me. I can only imagine where she came from. My human’s boyfriend took her away when he went off to work in the morning. I was both relieved and disappointed. I mean, I’m always interested in checking out a new cat — just so long as they know their place and don’t stick around for too long. But a couple of days later, she came back and she had a cone on her head. Apparently, along with getting shots and being tested for any serious cat diseases (she got a clean bill of health), she got spayed, and she kept trying to pull at the stitches. (Clearly she is none too bright.) 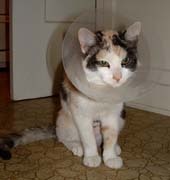 Unfortunately the whole cone thing always freaks me out, so any friendship between me and this cat got off to a rocky start. My human assured me that the calico cat was only going to be around temporarily and that she would be going to a “good home.” But her boyfriend really took a liking to her. 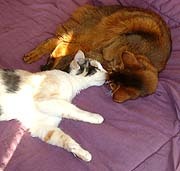 The calico wasn’t too dense to realize that kissing up to the humans was a very good idea. She even got buddy-buddy with the dog (yeech). 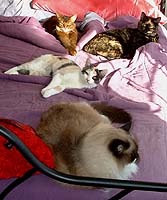 My human insisted that four cats were too many. “Maybe we can get rid of Boodie,” her boyfriend suggested. He was only kidding (I think), but Boodie didn’t get the joke. Well, this calico figured that if she was going to be around for a while, she had free reign of the house and could do whatever she wanted. She immediately took over. I was not pleased with this turn of events. After the house was tented, my lazy human never completely unpacked all the cat toys and left them sitting around in a cardboard box. This cat decided that she could go into the box and get whatever she wanted. In fact, she knocked the whole thing over and just ran rampant with all the stuff. I thought the mess was kind of cool until it occurred to me that it was all my stuff. But playing with cat toys was not enough for her. She also hunted out as many of my human’s dumb plush toys as possible and tried to kill them all. I wholeheartedly approved of that, although I didn’t have the heart to tell her that they were all already dead because we three cats had killed them months ago. The worst thing this cat did, however, was invade our space. 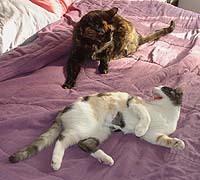 It was especially annoying when we were trying to take a nap on the bed. This upstart would wake me up from a peaceful snooze when I least expected it. 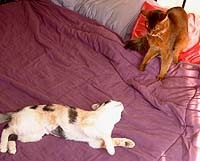 Binga, of course, hated her guts, but all her complaining didn’t phase this little cat one bit. She just hissed back and chased her off. Even Boodie, who usually likes other cats, never warmed up to her. Maybe it had something to do with my human’s boyfriend’s remark. In spite of our irritation, we were powerless to do anything about this situation. 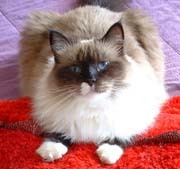 We cats as a rule are willful creatures, but this one takes willfulness into the major leagues. Naptime became an exercise in vexation. 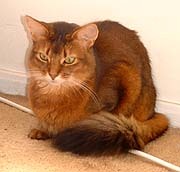 Usually, Binga and I have only the most tenuous of friendships, but this is one time when we have something in common: a vehement desire to see this cat gone. My human swears that she knows someone who will probably take her. This had better happen soon or we are going to revolt.